They say that love is the universal language, and while that is all well and good, if we're being honest with ourselves, it's actually food. Food is more than just sustenance to people. It's passion, creativity, history, memories, and culture all rolled up in one. It's why people go out for dinner on first dates. It's why holidays revolve around the kitchen and the table. It's why so many people start restaurants, even if it's one of the least successful ventures out there. 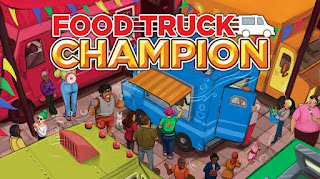 Recognizing people's love of food, Daily Magic Games took a popular game (Glory to Rome), re-themed it, and improved it to gives us Food Truck Champion! Food Truck Champion is game for 2-5 players, ages 8+. It takes approximately 60 minutes to play and you can own the game for a pledge of $24 on Kickstarter. 1. Give each player a Food Truck Board, their matching Owner Card, and a Starting Order Card. 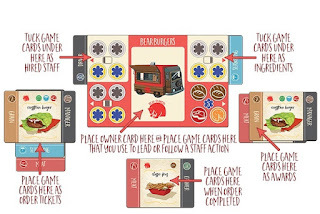 Place your Owner Card face-down on your player board and your Starting Order Card face-up below your Food Truck Board. 2. Shuffle the Game Cards and deal six to each player. This forms the player's starting hand and is kept secret. 3. Deal eight cards face-up in the center of the table to form the Marketplace, and place the remaining cards next to the Marketplace to form the draw deck. 4. Take two Popularity Tokens per player (valued 1 through 3) and sort them into stacks based on their value. Insert Critique Tokens into those stacks based on number of players. (Example: In a two-player game, a stack would look like this: two Popularity Tokens, one Critique Token, two Popularity Tokens, and one Critique Token. 5. Choose the starting player and give them the Active Player Card. 1. Market Research - Draw cards from the deck equal to your draw limit. If you end up with more than six cards, discard down to six. 2. Take Charge - Pick up your Owner Card from your Food Truck Board and add it to your hand. 3. Lead a Staff Action - Choose a card from your hand to lead a staff action. Announce which one you are leading (see below) and place the card in the center of your Food Truck Board. a. Driver: Move a card from the Marketplace to your Fridge as an Ingredient. b. Cashier: Move a card from the Marketplace to your Plating Area as an Order Ticket. c. Manager: Move a card from the Marketplace to your Hired Staff as a bonus staff action for future turns. d. Prep Cook: Move a card that is an Ingredient from your Fridge to an Order Ticket in your Plating Area. e. Executive Chef: Play a card as an Ingredient to your hand onto an Order Ticket in your Plating Area. Note: Players may follow you, in turn order, if they play a game card with a matching Staff Action or Owner Card from their hand. They can also follow if they have a matching card in their Hired Staff. When you complete an order by placing the last Ingredient on it, you remove the Order Ticket from your Plating Area and set it aside, turning it horizontal. You then take a Popularity Token equal to the number of ingredients required to complete the order. If a Critique Token is revealed, player review their Order Tickets and choose one for critique. Bonus points are awarded at the end of the game for each set of flavor profile ingredients you collect. The game ends when two stacks of Popularity Tokens are exhausted. We are all familiar with games that have multi-purpose cards, the most famous being Glory to Rome. Food Truck Champion takes this mechanic, and gives it a different flavor that more people can relate to...food! Couple the theme with the art of Claire Donaldson (of the Go Nuts for Donuts fame) and you have a meaty game that is sure to have everyone coming back for seconds! I really like how each player's truck has its own personality and cooking style. The names are clever too...Sol Sisters and Herban Garden are both very punny and reflective of their signature dishes. Some examples of the food include classic fries, grandma's apple pie, sticky rice cakes, and pickled beet salad. The game requires a great deal concentration to play due to the timing involved in playing this game. You may think you have the perfect action, but since people have the ability to follow your action, they might end up having a better turn than you did. Sometimes your concentration is broken though, because these cards make you so hungry! If this sounds like a fun game to you, I highly encourage you to back it on Kickstarter. You won't be disappointed!